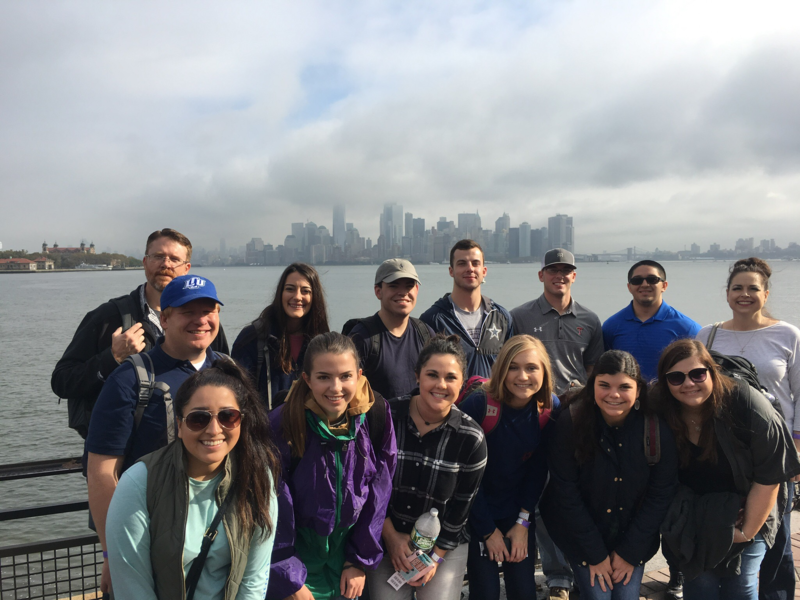 Over fall break there were several students from LCU who went to New York for a business class. Mariah Cannon, a sophomore Criminal Justice major from Mansfield, Texas, gave me her perspective on the trip. Q: What class was this for? A: The class is literally called the “New York Trip.” It is open to all students, but generally, business students. I am not a business student, but I am vice president of Business Connect so that is why I attended. Back row left to right: Joseph Ellis, Emma Holder, Braxton Whittle, Josiah Stewart, Reese Rogers, Lucas Ontiveros, Dr. Vanda Pauwels. Front row left to right: Dan Tingle, Amber Jane Solinas, Mariah Cannon, Haley Ankerholz, Michaela Nunnally, Ashley Cardwell, Shayla Ross. Q: What work was involved with the trip? A: Before the trip, we had to write about two papers per week. Each of them was about the different places that we would be visiting. We also have to write a reflection paper, thank you notes to the people we visited with, and a spending summary now that we are back. Q: How did the class prepare you for the trip? A: The class itself never had to meet. It was an online class before and after the trip. The papers that we had to write helped prepare us for the trip because we learned about things before we went to them. It was kind of cool hearing the same things we had written about while we were on tours. Q: What were some of things the group do? A: We did so much [on]this trip! We were busy the entirety of [the]five days. Of the more professional things that we did, meeting with Amanda Hale [LCU Alumna, in her office in Rockefeller Plaza] was really cool. She gave us business advice and talked about the importance of personal branding. Of course we also did so many “touristy” things, including visiting Times Square, the Empire State Building, the Statue of Liberty, the Brooklyn Bridge, the 9/11 Tribute World Trade Center, and Broadway! A: I have two favorites. The Broadway shows that we saw were absolutely amazing. We saw Wicked and the Phantom of the Opera and I was expecting them to be great, but [I] was blown away. My other favorite thing was a guided tour we took of the 9/11 Tribute World Trade Center. Our guide was a retired firefighter who was a first responder to 9/11. Not only that, he lost two nephews who were also first responders that day. Q: Would you recommend this to younger classmen? A: I would definitely recommend this trip to younger classmen. It is a lot of work up until the trip, but it is such a good experience and you can put it on your resume. Q: What made you want to go? A: I personally wanted to go because my sister had gone a few years ago and told me how much fun it was! I also thought it would be a great business experience. As you can see, this trip was an impactful experience for Mariah. If you are a business student or simply looking for a meaningful way to visit New York City, this class would be perfect. To get information about it and other upcoming events, contact Kathy Crockett, associate professor in the LCU School of Business.